The traditional Thanksgiving Food includes: turkey, stuffing, mashed potatoes and gravy, sweet potatoes, ham, cranberries, rolls, green beans or corn, and topped off with pumpkin pie! It's a high-fat, carbohydrate feast that would put us off, any other day of the year, but is a must for Thanksgiving! Or is it? Skip the pre-meal appetizers. You know...those dips and chips that add hundreds of extra calories, and fill you up before the serious eating begins! 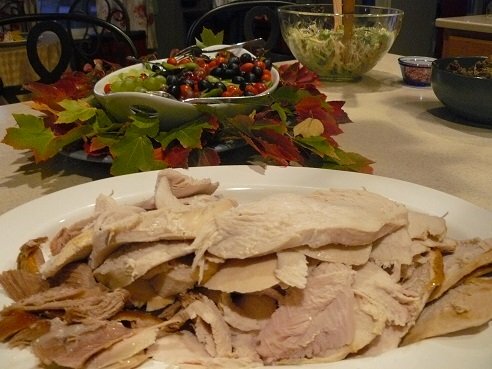 Downsize your turkey to a chicken, or cornish game hens if you are cooking for a small group. Turkey's are hard to cook, because they are so big. Chickens taste better, are easier to handle, and are less fussy to cook and carve! 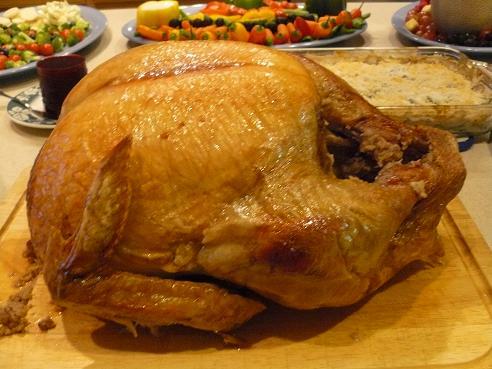 If you do decide to cook a turkey, you can always cook it the day ahead of time and just heat it up on Thanksgiving! This works out well if you decide to use a smoker to smoke your turkey. We often would smoke two turkeys the day before, and freeze lots of leftovers. Unless you just love the last minute hassle of gravy; buy healthy pre-made gravy. This will greatly cut out last minute stress, or have a relative make it at home and bring it! If you cook your turkey the day before, go ahead and make your gravy from the turkey and just reheat it the day of. Make your cranberry sauce from scratch rather than buying it from the can. You can add less sugar, and the end product does not even taste similar. Choose only one other carbohydrate between potatoes, yams, corn or peas. Enjoy the real vegetable, rather than adding lots of fattening goodies. Simple foods taste great! mashed potatoes can be made ahead of time and kept warm in the oven, to eliminate the last minute stress too. Add a fresh low carbohydrate vegetable to the meal. Ditch the green bean casserole. Fresh green beans taste so much better and can be served with some sliced toasted almonds. Fix a low carbohydrate fresh salad that is not full of fattening goodies! A green salad full of fresh ingredients will be a highlight of the heavy meal! 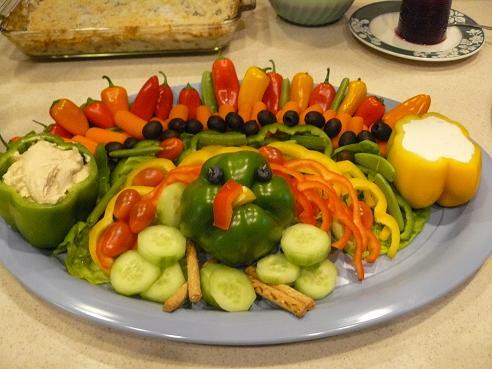 Try making a Vegetable Turkey - pictured below! See our Tips on Making a Produce Tray. 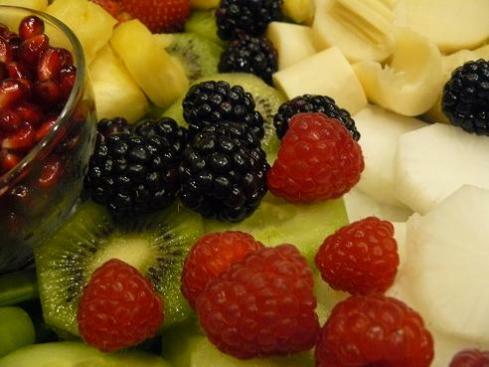 Fix a fresh fruit salad, rather than a Jello-O salad full of canned fruits or marshmallows. Fresh fruits are a treat at this time of year. 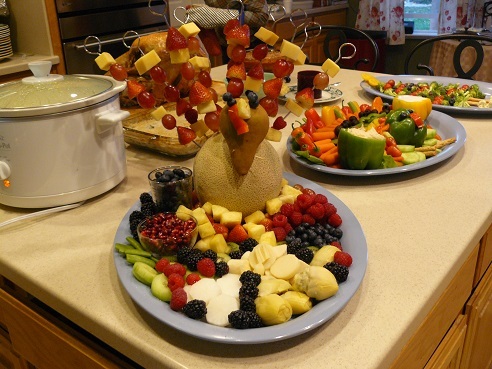 Below, we just made a fruit platter and used a cantaloupe and a pear to form a turkey, and then added strawberry, grapes and cheese skewers poked into the cantaloupe to form the turkey feathers. We have some vegan and vegetarian eaters in the family who don't eat turkey, so we always serve an overabundance of fresh fruits and veggies, so they don't starve! 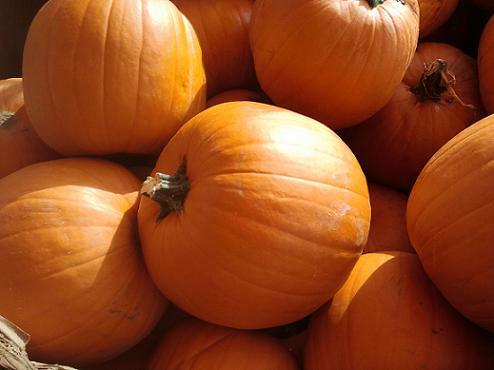 Stick with pumpkin pie, or a lower calorie dessert choice. Serve only small portions. Remember that Costco pies are meant to be cut into 16th and not 8th! No need for huge pie pieces, when such a heavy meal has already been consumed. You guests will thank you! You can always take a walk after your meal and before dessert too. The goal of the Thanksgiving food should be simplicity! Great ingredients fixed in a simple manner. Fix as many of the dishes from simple, scratch recipes, using real foods. Choose recipes that can be fixed the day before, to eliminate stress, and allow you to enjoy your family and friends! 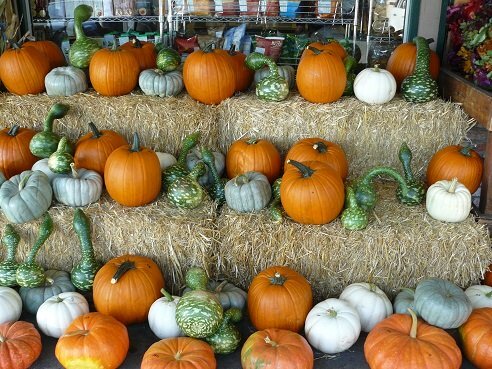 Please Follow our Holidays and Observances Thanksgiving Food - Holiday Board on Pinterest - below you will see our 30 most recent pins to this photo board!